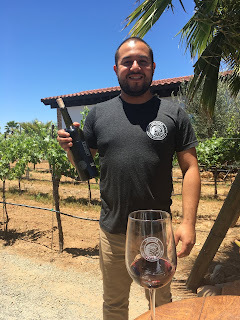 This is my second installment (first one HERE) of Vintastic Voyage featuring the Valle de Guadalupe area of Baja California. And it won’t be my last! Valle de Guadalupe is my new favorite weekend trip from LA. For one, the food scene is insane….trust me. You will eat VERY well while you are here, and will not break the bank! There are many wineries: from small mom and pop spots to larger wineries with a more corporate feel. In short, there is something for everyone. What I really love about this place are the people. It’s the combination of wine country with the Mexican hospitality I so love. So much so that I am already planning my trip back! This is a recap of my June visit with a girlfriend of mine. We left Los Angeles at about 7am on a Saturday morning and returned to LA Monday afternoon. It was a 48-hour whirlwind, and I’d do it again in a heartbeat. 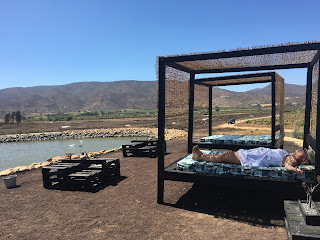 We opted to drive to Valle de Guadalupe. From LA proper, with no stops, it is about a 3.5 hour trip. Before you cross the border, you do need to secure Mexican auto insurance, which you can do easily if you are a AAA member. I secured a 2-day policy for about $40. We reached the border by about 10am after stopping for coffee and gas. Once past the border, you instantly feel you’re on vacation. The Pacific coastline on the drive down Baja is gorgeous. In my opinion, it doesn’t get the recognition it deserves. A favorite stop of mine is Puerto Nuevo, a small fishing town about 10 miles south of Rosarito. The “town” consists of a small drag right on the water with shopping (Mexican handicrafts) and lobster restaurants. 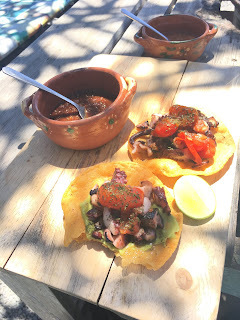 We definitely wanted lunch and decided on La Casa del Pescador at the recommendation of Erika Beach, a fellow wine blogger at With Love, Paper and Wine. See her post HERE. La Casa del Pescador did not disappoint. The lunch was $20 each and included: soup, a full grilled lobster, fresh tortillas, the fixins’, and a margarita! From there we headed further south and then inland to Valle de Guadalupe. One thing to know about traveling here, especially if you are driving, is that there are hardly any street signs…..at all. Lots of “roads” are still dirt, and Google Maps/Waze does not tell you if you will be on a paved road or a dirt road. We had a lot of trouble finding our hotel, and found that the GPS wasn’t working properly. At one point it took us to this dirt road that dead ended at a private property with goats yelling…..and I mean yelling(!) at us. I recommend you secure directions ahead of time (call/email your hotel to get their directions that will include landmarks). Once we made it through that fiasco, we arrived at the brand new El Cielo Resort. We were a bit worried at first, as the property clearly was not finished and in the middle of some MAJOR construction. But once we found the front desk and sat in the air conditioned lobby with a complimentary glass of wine, all was well! We found the staff friendly, helpful, and welcoming. They got us checked in, and what a room we had! 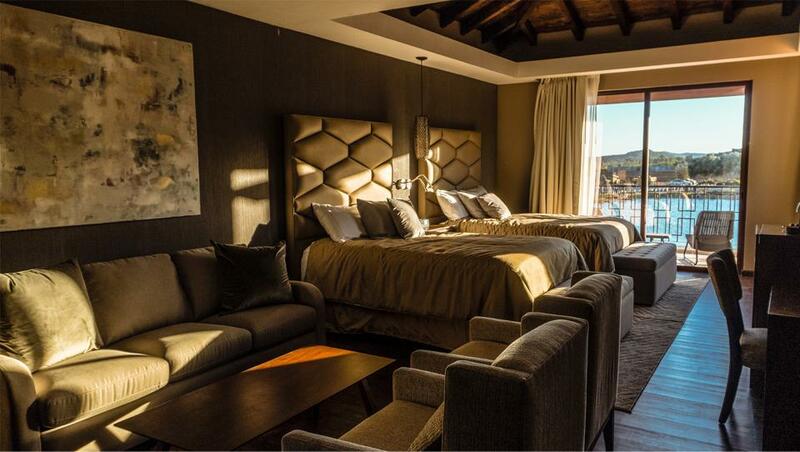 This hotel is brand spanking new, and they are only in Phase 1 of development. The rooms were clean, bright, comfortable, and luxurious. We had a suite with a king bed. There was also a living area with a mini fridge/mini bar. The rooms even had Nespresso machines and frothers. SUCH a nice touch! The bathroom was amazing: his and hers sinks, huge shower, and a separate toilet room. Plus, cushy robes! Definitely worth every penny. After being here three times, I can say the one piece you will spend $$ on in VdG is lodging. But don’t worry, you will save $$ with literally everything else, as the food and wine is super affordable, especially for the quality level. We had a long day driving, so we took our time the first afternoon. We napped, showered, and enjoyed the lobby a bit more. They put out complimentary snacks (meats, cheeses, and sweets), will happily refill your wine, and even have a selection of top shelf spirits and mixers that are self-serve. Once we had sufficiently relaxed and freshened up, we headed to dinner at Finca Altozano, which turned out to be one of my favorite places on this whole trip! The entire property and restaurant is partially or completely outdoors. The restaurant actually has no walls….it’s entirely open to the outdoors. This place was awesome: a great menu, lovely atmosphere, and friendly staff. On the website, the restaurant is described as an “asador campestre”, which translates to country BBQ. The renowned Mexican chef Javier Plascencia is at the helm of Finca Altozano, which not only is a restaurant, but also has a bar, coffee shop, helado shop, permanent food truck, and “petting” zoo onsite! When I go back, I will be sure to plan some time on the front/back end to explore and enjoy. The perfect evening would be to arrive early for a cocktail, enjoy dinner, and then coffee and dessert! To die for. We each had 3 drinks, an appetizer, we shared an entree, split dessert, and the total bill was $80 (which includes tip). The next morning we started out at Vinos Lechuza. They have completed ten harvests and have been open to the public for five years. Their claim to fame is that some of their wines are served at French Laundry in Napa. Thomas Keller discovered the Vinos Lechuza wines while in Cabo San Lucas, and subsequently added them to his French Laundry wine list. It’s a small(ish) property with a simple tasting room, and beautiful outdoor space. Be sure to do the tasting outside on their patio...it’s beautiful. They offered great service with a very nice staff who gave us a brilliant, personalized experience. This wine spends 8 months in stainless steel tanks with bâttonage. I get green fruit (green apples and pears) on the nose plus MLF notes of dairy/cream. This wine has a medium + body with a pleasing texture which can come from the bâttonage or perhaps skin contact? This fruit for this rosé is 100% estate (60% Cabernet Sauvignon, 30% Merlot, and 10% Tempranillo). This wine (saignee method) had been bottled only two weeks prior, so it was still going through some bottleshock and was not fully integrated. They said it should be ready in a month or so. For now I get all red fruit (cherry and cranberry). The fruit for this wine is 100% estate (grapes include: Cabernet Sauvignon, Merlot, Tempranillo, Nebbiolo, and Graciano) and spends 24 months in a combination or American and French oak. I get red fruit (plum, cherry, and raspberry), floral (rose petals), sweet baking spice, plus cedar from the oak. This is a very easy, drinkable red that I’d describe as round and well-balanced. This wine spends 32 months in new French oak and was bottled only 12 days ago. As can be expected, this is a completely different Nebbiolo expression than those found in Piemonte. This wine is earthy, and has a tobacco note that I loved. I get a strong note (on the nose and palate) of some sort of minerality. On the palate I described it as clay. This wine spends 24 months in new American oak. I get ripe black fruit (blackberry and cassis), black pepper, and fresh cut green bell pepper. This wine is smooth and yet with a long, complex finish. On the back palate I get tobacco/cigar pipe. Strong, well-integrated tannins. 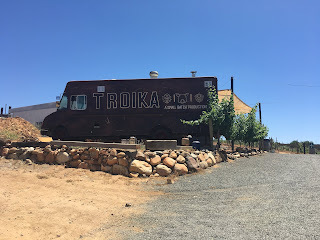 After Lechuza, for lunch we had to try Troika, a permanent food truck on the Vena Cava property. Getting here proved to be one of the hardest parts of this trip. I think we were 2 miles away and it took us over an hour to get there. We tried Waze, Google Maps, and stopping to ask for directions to no avail! We finally called Troika and someone there was able to guide us. Phew! We had arrived and let me tell you, it was worth it! The property, the views, all top notch. And the food did not disappoint. We started with ceviche, had 2 types of tacos, dessert, and a beer. All for $20 TOTAL. Believe it or not, after the one winery and lunch we were done and ready for a siesta! So back to El Cielo we went! We napped and refreshed and were off for the evening. To start we went to the winery at El Cielo for a tasting, as that was complimentary with our hotel stay. It was not until we got there that I realized I had been there before for a wine tasting. This was not my favorite place...in my opinion the wines leave a bit to be desired, so we’ll move right into dinner. We hopped into an Uber and off to Deckman’s En Mogor. Drew Deckman came to Baja (he’s originally from Georgia) a few years ago….before it was cool. AND he has a Michelin star under his belt! Deckman’s is completely outdoors. The outdoor kitchen and grill is the first thing you see when you walk in. Huge pots of seafood, bread cooking/toasting on an open hearth. This meal was nothing short of amazing. We shared two appetizers, two entrees, a dessert, and three glasses of wine each ad our bill was also $80 TOTAL (including tip). The value is incredible. Sidenote: In case you were wondering, there is NO nightlife in the Valle. None at all. By 8pm, pretty much everything is shut down. And with the lack of infrastructure (paved roads, and street lights), you’ll want to be home and in your hotel come nightfall. On our way back home the next morning we stopped at Caesar’s in Tijuana to enjoy a caesar salad where it was invented in 1927. This place looks like you stepped right out of the 50s. In fact, it reminded me of Musso & Frank’s in Hollywood. A total throwback. From the servers black and white attire, the copper espresso machine from the 1920s, and the copious amount of dark cherry wood everywhere. I have to say, this was one amazing caesar salad. No shortage of creaminess, zest, and tanginess. Everything you’d want in a caesar salad. From Tijuana, it can take quite a long time to cross the border. This time it took about 3 hours, and that was on a Monday. Plan for longer if it’s a Sunday! If you go into it expecting there to be a wait, it won’t be so bad. There are many locals selling stuff as you wait. I recommend the aguas frescas and fresh churros. Also, there are a couple carts selling fresh tortillas. Grab a couple bags and you can freeze them when you get home, so you always have fresh tortillas available!